As we enjoy our escape from the winds, rain and snow north of the border, we are thankful for the amenities SunBird has to offer. One would be exhausted, were they so inclined, to avail themselves of the activities that are available at the clubhouse, on the golf course and at the many courts situated throughout our gated and secure compound. Our Pork Loin BBQ and Social, on February 9, is the largest social event of our season. Last year, we hosted over 250 Canadians. It is $7.00 per plate and will be held on the patio from 3:00-6:00 p.m. (BYOB). Look for an email registration or contact Mike and Susan McMillan at msmcmillan@rogers.com to get on our list. Details are on our poster in the clubhouse. This event is followed by the Great Canadian Golf Tournament on March 19 with a shotgun start at noon. Pre-registration will take place at the BBQ. The cost is $40 per person which includes golf and a pizza dinner in the ballroom. This tournament is a social scramble for Canadian golfers of all levels of experience. Come and join us. 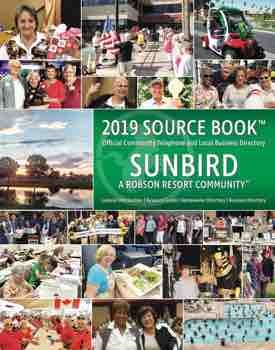 The golf club was the beneficiary of our most recent donation to the SunBird community. We purchased a tent to provide protection from the sun at our snack station at the GCG Tournament.